ECSWT is a new piece of high-tech equipment that creates shockwaves. Is Extracorporeal Shockwave therapy for you? 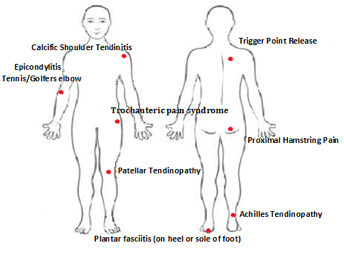 If you have pain in one of these areas it might be! What is ECSWT and what are shockwaves? ECSWT is a new piece of high-tech equipment that creates shockwaves. Shockwaves are pulses of energy that can be used to initiate a healing response in damaged tissue. They are delivered via short bursts of compressed air exerted by the handpiece of the machine. Research has shown that it helps to promote the growth of new tiny blood vessels by restarting the inflammation process in the treated areas. This is needed to promote healing. This in turn can also decrease pain in the area being treated. The physiotherapist will assess your condition to determine if ECSWT is a suitable form of treatment. They will then select appropriate settings on the ECSWT machine. Before continuing the physiotherapist will palpate to find the treatment area. A lubricating gel will be applied over the treatment site and ECSWT will be applied via the treatment head. The physiotherapist will move the treatment head to treat all of the injured tissue. The ECSWT will generally last between 2-3 minutes. The Physiotherapist will also provide advice and exercises to complement the treatment and aid recovery. Although not effective for everyone improvements should be noted after 3-6 sessions. Treatment sessions will usually be carried out weekly. Pain relief may be noted post treatment but may return the next day. Improvements can continue up to 2-3 months after treatment. ECSWT is a relatively new form of treatment. There is ongoing research into its effectiveness conducted by N.I.C.E, and to date results have been largely positive. “Is treatment painful?” Sometimes the treatment can be uncomfortable due to the stress through the tissue. The pressure can be decreased if you feel it is very sore. Most patients can tolerate this for the treatment session. “Will I have pain after the treatment?” Normally you will experience reduced pain post treatment but a dull ache may occur a few hours later which can last a couple of days. If you wish to book an appointment for ECSWT you can self refer directly to the physiotherapy dept. If you have health insurance and it covers physiotherapy, then you will need a GP or Consultant referral. Phone 028 777 63090 and select option 7 for the Physiotherapy Clinic. Click the button below to set up your consultation or for further information about Extracorporeal Shockwave.